Sharp's new MX - 4101N series color multifunction document systems have been meticulously engineered to help businesses maximize their document workflow efficiency while providing outstanding image quality and performance. These new models offer many advanced features such as a large, high resolution touch -screen color display with graphical menu navigation and a retractable keyboard to make data entry easy. 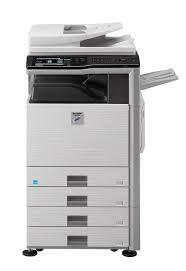 Optional Super G3 fax module offers advanced features such as automatic stapled/copied receptions.